The Brooklyn Museum is a timeless wedding locale for couples who love exploring different cultures and historical periods. Brooklyn Museum Wedding Photographers are privy to extravagant events, filled with vibrant color and life. The borough of Brooklyn has evolved into one of the most diverse, creative, and exciting urban centers in the world. The museum was created with the intention of bringing that diversity and creativity together in one building. Weddings at the Brooklyn Museum are especially unique and surround guests with art that spans history and modern times, captured by Brooklyn Museum Wedding Photographers. The day of the wedding pictured began with a Jewish wedding ceremony. In the photograph, the bride and groom stand together under a tallit. The tallit is a simple arm and shoulder covering that is meant to create a private sanctuary between the wearer and God. Jewish religious texts have compared the fabric to a tent that envelopes the physical body and the spiritual soul, so it is worn during prayer and celebration. 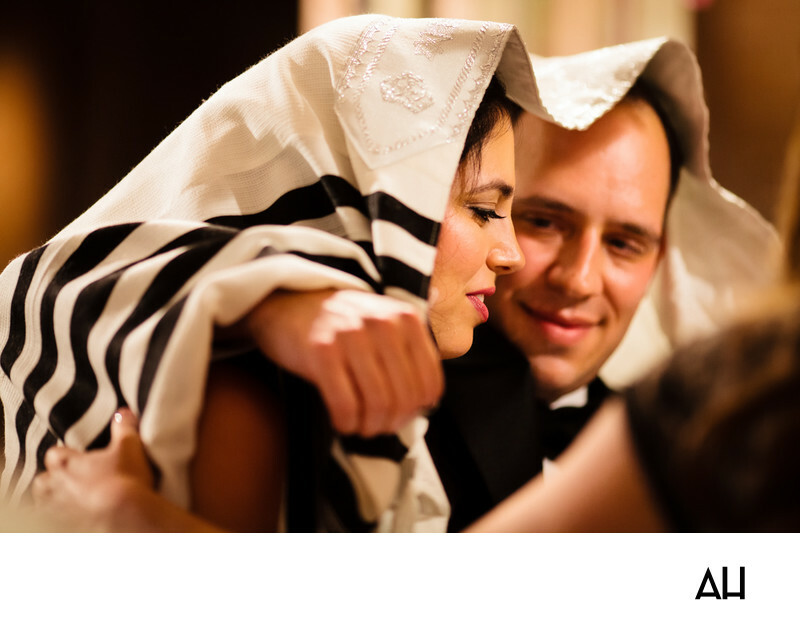 For this reason, some Jewish wedding ceremonies include the wearing of this cloak. In this image, the groom gazes over at his bride, his expression radiating love. The bride is looking downward, her long eyelashes brushing over her cheek as she smiles under the attention of her future husband. It is a tender moment between the bride and groom, with the tallit covering them and unifying the pair in the presence of God. The have become partners in every way, and will walk together through life for the rest of their days.